Choosing the right breed of dog for your family is extremely important. Will the dog get along with kids and other pets? Does the dog have a good temperament? Are they easy to train? These are the types of questions you have to ask yourself. Are you looking for a purebred or is that not very important to you? Mixed breed dogs can be easier on the wallet, where purebreds can be quite spendy. Don’t rule out adopting a mutt from your local dog shelter either. They can be just as loving, smart, and loyal as other dog breeds. Another important question you need to ask is the size of the dog. Are you looking for a lap dog or do you fancy larger breeds? Do you have room in your home for a large dog? Large dogs tend to need some room to roam. If you have a large yard or you are able to give daily walks, this could enable you to search for a big dog. Personality is another important aspect to consider. Some dogs can be quite aggressive around children or other pets, while others are OK. Do a little dog breed research at the AKC for more information. Personally, if you have small children, I would go with a naturally loving breed such as a boxer or yellow lab. They make great family dogs and have great protection instincts. 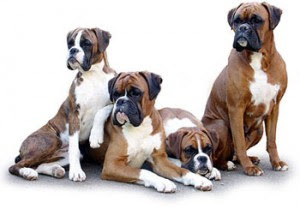 Boxers are known to be extremely gentle and easy to train. There are many great places to start your dog search. Maybe write a list of the qualities you are looking for and compare them to dog breed directories online. If you are too impatient to get a new best friend in the house, check out your local animal shelter or contact ASPCA for their selection of dogs.